A few months ago, when I was hosting one of the Events for the World food Programme – Time to be Thankful, Lisa, of Lisa’s Vegetarian Kitchen, participated with a lovely recipe of Black-eyed pea Patties. I bookmarked the recipe and decided to give it a try some weeks ago, adding a few ingredients of my own, as a side dish with the Spiced Rubbed Salmon I posted a few days ago and with some Taco Sauce. 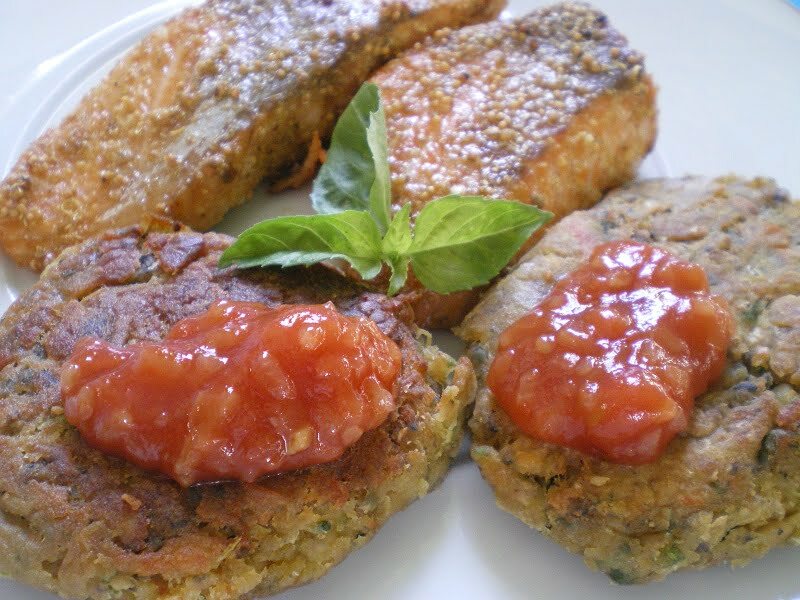 I am trying to add more legumes to our nutrition as these patties are very healthy, packed with vitamins and so delicious I will be making them regularly from now on. This recipe goes to The Well Seasoned Cook’s Eighth Helping of “My Legume Love Affair”. In Greece, black-eyed peas do not need to be soaked in water overnight but in several countries they do, so follow the instructions on the package if they do. Add black eyed peas in a pot with enough water to cover them and bring to a boil and simmer for 15 minutes. Drain and add fresh water. Bring to a boil and simmer until they are soft, about 45 minutes. Drain and set aside. In a food processor, combine, onions, garlic, parsley, red and green peppers and mince. Mash the black-eyed peas and add the minced ingredients, as well as the egg, semolina, and spices and mix well. Form into patties and dredge with flour. Heat olive oil in a sautéing pan and sauté until golden brown on both sides. I am also sending this recipe over to Ruth, of Bookmarked Recipes. A type of meal I always enjoy! These patties look good! I love the healthy parts of this dish Ivy…and I like all kinds of beans. This kind of dishes are so good for you and so easy to make. Great job adapting this recipe. Like the black bean burgers I recently posted about these look like a delicious and healthy alternative. And, not necessarily ‘alternative’…it’s good enough for first choice! Wow simply yummylicious…..Perfect and healthy….. This is regarding posting a recipe for Blogger Aid. Can i participate in this event dear. Then what i have to do? Pass me few of those delicious patties, they look so yummy delicious. I do remember Lisa’s patties and have them bookmarked to try myself someday. Thanks for the reminder Sis. I am sure you are having a fabulous time with your company.ENJOY!!!!! Very tasty! I’ve bookmarked this myself. These look wonderful! I love bean patties of all different varieties! These look really scrummy, Ivy! I love bean burgers. Thanks so much for sharing them for MLLA8! These look great, Ivy. I love beans! I haven’t eaten black-eyed peas as much as other types, but I should remember to buy them more often! A belated happy valentine’s day, Ivy! Those patties really do look good. We’re trying to eat less meat so these are a welcome idea. I wonder if they’d work with other dried beans? Dee, certainly with chickpeas and why not with other beans as well. Will put dried chickpeas on the shopping list. I’ve only got canned 🙂 And thanks again! Ivy, what a great idea with fagioli dall’occhio ! I’m delighted that you had a chance to try this recipe Ivy. Looks like they turned out perfectly for you. Delicious, healthy and quite satisfying too! I LOVE black eyed peas! These patties look so tempting. Ivy, you’ve got a great dish for Lent…the keftedes look fab! I’m trying to eat more legumes too! By “trying”, I mean, at least one recipe (since I haven’t done it yet) I’m starring this one. Ivy those patties looks so yummy and healthy! These remind me of a Nigerian Black Eye pea patty that my sister in law makes, but a tad healthier. I’ll have to try these, as I love the others. Protein rich and absolutely tasty. We call patties cutlets here, though I don’t know why!